Specific to Social Security, the report revealed the program's Disability Insurance (DI) Trust Fund will "become depleted in the third quarter of 2023." The program will be able to pay only 89 percent of benefits. The Old-Age and Survivors Insurance (OASI) Trust Fund will be exhausted in 2035, allowing the federal government to pay only 77 percent of benefits. Medicare won't be able to pay its full liabilities in 2028. 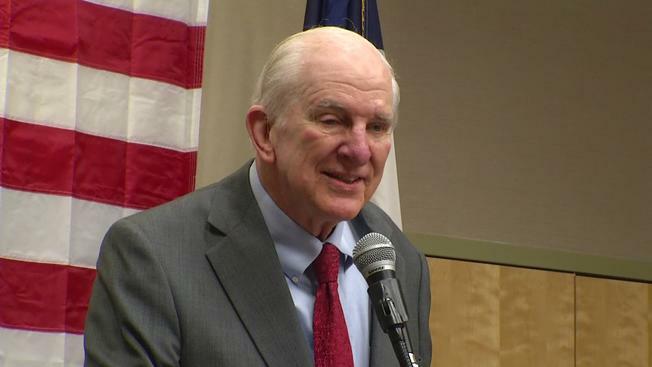 At 82 years, Rep. Johnson, who is retiring at the end of his current term, is one of the oldest members of Congress. While he hasn't yet reintroduced his bill, the Social Security Reform Act, in the 115th Congress, Rep. Johnson wants to ensure the viability of the program for current and future generations. Unlike most in Congress who talk about the issue, Rep. Johnson is one of the few to actually introduce legislative text to address the problem. "For years I've talked about the need to fix Social Security so that our children and grandchildren can count on it to be there for them just like it’s there for today’s seniors and individuals with disabilities," Johnson said when he introduced the Social Security Reform Act. "My commonsense plan is the start of a fact-based conversation about how we do just that. I urge my colleagues to also put pen to paper and offer their ideas about how they would save Social Security for generations to come. Americans want, need, and deserve for us to finally come up with a solution to saving this important program." The Social Security Reform Act offers modest changes to current law that would extend the viability of the trust funds, and it would do so without a tax increase. As introduced in the 114th Congress, the bill would increase payments to low-income Americans while reducing them for high-income Americans. It would increase the retirement age over time to 69 from 67 for those before in 1960 or after. Those who are able to work until 72 would collect larger benefits. The bill would change how benefits are calculated by indexing cost of living adjustments (COLA) for individuals who earn less than $85,000 and joint filers who earn less than $175,000 to the chained consumer price index (CPI), which allows for a slower growth of benefits. Those earned above these income thresholds wouldn't see an adjustment. The Social Security Reform Act also offered other reforms, such as allowing Americans to receive benefits while they're working without a penalty, a gradual elimination of the tax on benefits for those who earn an income after retirement, and a cap on the benefits that survivors of high-income earners can receive. In a December letter to Rep. Johnson, Social Security's Chief Actuary wrote, "For the 75-year (long-range) period as a whole, the current-law unfunded obligation of $11.4 trillion is replaced by a positive trust fund reserve of $0.6 trillion in present value assuming enactment of the proposal." While the Social Security Reform Act reduced revenues by $2 trillion, it decreased costs by $13.9 trillion, creating a $600 billion surplus for the Social Security trust funds. Should the Social Security Reform Act be reintroduced in the 115th Congress, Democrats and some Republicans would be an obstacle to movement on the bill. In March 2005, the last time there was a serious discussion of reforming the New Deal-era program, congressional Democrats protested at a statute of President Frankin D. Roosevelt, who signed the Social Security Act into law in 1935, and vowed to fight a plan put forward by President George W. Bush. If that stubborn opposition remains, and it certainly does, given that some Democrats actually want to expand the program, Social Security will go bankrupt sooner rather than later.